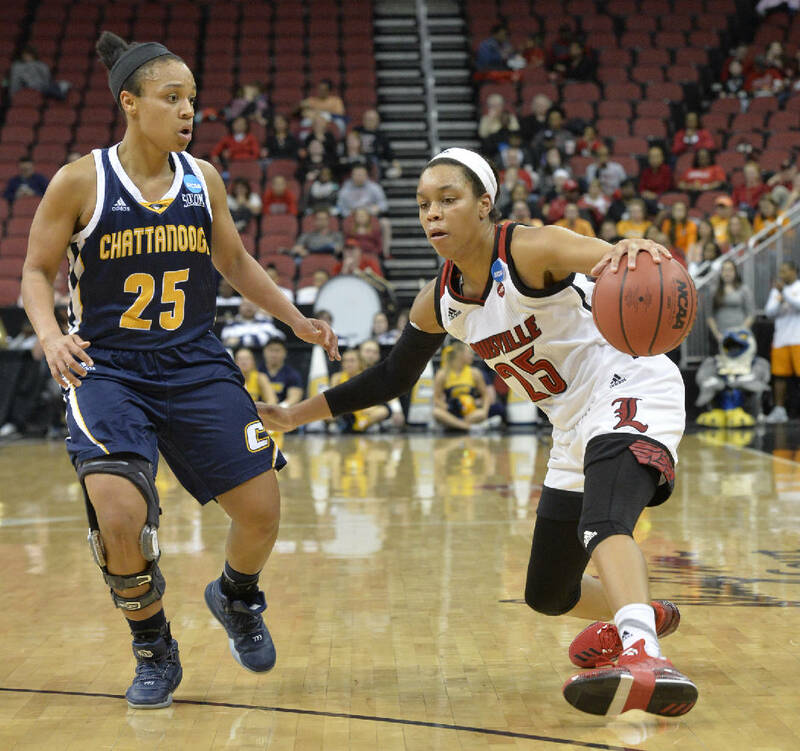 LOUISVILLE, Ky. — The University of Tennessee at Chattanooga women's basketball team played like a group with its back against the wall for most of Saturday's game against home-standing Louisville. The Mocs took body blow after body blow, twisting and turning and absorbing the brunt of each shot. The Cardinals then hit the Mocs with a haymaker, and the visitors never could recover. Led by nine points in a four-minute span by star Asia Durr, the Cardinals outscored the Mocs 20-6 in the first 6:03 of the final period to break open a single-digit game and win 82-62 to advance to the second round of the NCAA tournament. "That's what very good teams do," UTC coach Jim Foster said. "We have to have a score-stop mentality. I thought we had a lot of good looks, but their mentality to come right back at us, you've got to fight that. You've got to fight that. A score and a stop is how you play the game. Not score, let them score, score, let them score, especially when we cut it to four. "Just pull your shorts up and work that much harder on defense." Saturday marked the end of the careers of Jasmine Joyner, Queen Alford, Moses Johnson and Sydney Vanlandingham. It also was the Mocs' fifth consecutive first-round loss in the national tournament. They battled, with 10 3-pointers in the first three quarters to stay within striking distance, just needing a stop here or there, a basket here or there to really give themselves a chance. In those first three quarters, they made three more 3s than 2-pointers (seven), taking advantage of shots that were allotted to them once they beat the Louisville press. They finished 21-for-56 (38 percent) from the field for the game, but a good percentage of those shots were open looks. They just couldn't make them. "We got good shots," UTC point guard Chelsey Shumpert said. "Sometimes 3s don't fall, so you've got to work around that somehow, someway. "But throughout the game I thought we got good shots." But too many times, they didn't even get a chance. UTC had 15 turnovers for the game, which led to a number of easy runouts for the Cardinals, who had 22 points off those turnovers. Alford, Lakelyn Bouldin and Shumpert each made three 3s. Bouldin scored 16 points to lead the Mocs. Alford had 15, while Shumpert finished with 13 points and six assists. Joyner had 11 points and a team-high seven rebounds. The Cardinals shot 61 percent from the field, with 28 assists on 36 made baskets. Durr had 27 points to lead four double-figure scorers. Myisha Hines-Allen had 16 points, 12 rebounds and five assists; Jazmine Jones had 14 points off the bench on 7-for-8 shooting, while Kylee Shook scored 10. Mariya Moore finished with only six points on a pair of 3-pointers but had 10 assists. "They were just more athletic, quick, and they were just a very good team," Joyner said. Louisville used a 15-0 run to build a 20-14 lead after a quarter. The margin grew to 11 in the second quarter, and although the Mocs were able to cut it to 32-28, the Cardinals used an 8-2 run to take a 10-point lead into the break. The lead hovered between seven and 12 in the third quarter and was 58-49 headed into the final period before the Cardinals' final run put the game away. "I think they capitalized off of our mistakes," Alford said. "If somebody didn't close out, they went around us. If they couldn't get open, they found a gap. That's what good players do. "That's what pretty good teams do."